Packaging can be important in marketing – it’s why major brands spend huge amounts of cash on design. Some beekeepers have bespoke labels printed for their honey, whilst others use a standard label, and hand-write their own details, name and so on, but if you want to sell your honey beyond your circle of family and friends, it’s a good idea to put a little extra thought into how your honey is presented. Here are a few thoughts and ideas to take into consideration before you apply the label! Which of your honey offerings would be appropriate, and hopefully offer a point of difference to the retailer and the buyer? In view of the above, how should you label your honey? (Sufficient information, but without the label being too cluttered). 2. How Are Other Products Packaged? Relating to the above, if you are targeting the likes of health and gourmet stores, take a leaf out of the book of the experts! For example, how are other gourmet products packaged? I notice quite a lot of transparent packaging and labels when I go in to delicatessens. I think this allows the food product to speak for itself! It shouts out: “This is wholesome, natural, good food – see for yourself”. Somehow, it’s worth paying more for!! If you are going to leave comb in the jar, I think it’s a shame not to be-able to see it – don’t you? On the other hand, there are other ways to present a product to look wholesome and natural, for example, with a 'rustic' label. (- or heaven forbid, even ‘unhygienic’). 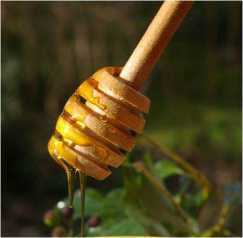 However, if you present your honey in the right way, it will help you sell it at the correct price. This, of course, has to be a consideration. You can purchase ready designed labels – this would probably be the cheapest option, but you won’t achieve much stand out, and if you have to handwrite your own details, you’ll need to ensure your writing is clear – and attractive. On the other hand, there are facilities to design your own bespoke honey jar labels online – and quite cheaply, and yet still get excellent quality print. You could try StickerYou.com. I have seen premium labels for less than $20 per sheet at the time of writing, which I suspect is less than many beekeepers would expect (I believe they also offer a design service, but you’d need to ask them about any additional cost). 4. What Features Should Your Label Have? Easy peel as a feature? Wipe clean (remember, you won’t be the only person to handle the jar). Premium, glossy print, or a more ‘rustic’ look? Partially bespoke label or fully bespoke label? Do you need a label that won’t fade if your honey is displayed in direct sunlight? 5. Who Is The Purchaser? Is your honey for the gift market? How can you make it more ‘gifty’? A very pretty label – perhaps even a bow around the lid? Do your target customers care more about a particular taste (floral type)? If you have a specific taste (such as clover) – state it clearly on the label. Are you targeting the health conscious? If so, the label could afford to look a little more ‘clinical’ in appearance – take a look at the labelling for health supplements for ideas! If you have formal certification, remember to include the logo on the front of the label if this is permitted. 6. What Size And Shape? Have you purchased the jars yet? You could cut out pieces of paper to see which size (and shape) looks best, before you actually order the labels, and hence avoid costly mistakes. What other information could you include on a label at the back of the jar? - Your details if appropriate. - A bit of advice about ‘crystallization’? - Anything else you think is important – perhaps if you’d like to expand on information given at the front of the jar. Good luck with selling your honey! I'll be adding a few more articles about this subject in the future, so watch this space! Read about: Beekeeping Business Plan (with free template).